Calling all cars! Calling all cars! Hurry up and stop by Pepi Garage. Paint, customize, photoshoot your cars and unleash them into real world. 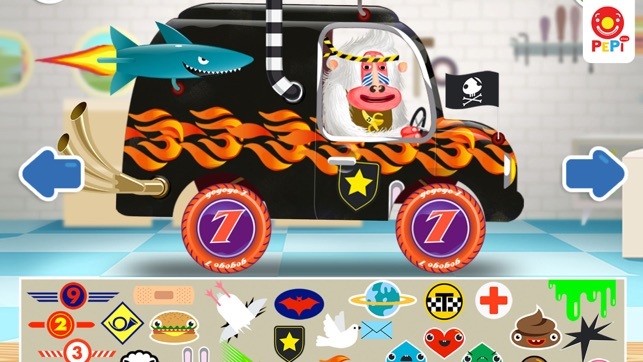 Garage is even outfitted with a camera tool, so grab this app and capture kidzillion of colourful and funny cars! 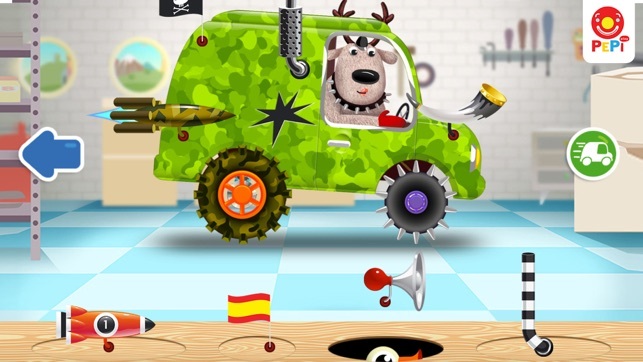 Pepi Garage is truly simple, yet very powerful tool to boost creativity and have fun. Built on the foundations of Pepi Ride, Pepi Garage introduces new characters, handful of paint cans and a whole new bunch of gadgets and stickers. With these amounts of tools, every car will be like no other! Join your kids in the garage and help them built a vehicle of their dreams. Customization tools are so simple, that any kid will be able to use them alone, though we encourage every parent to stick around for a small talk. 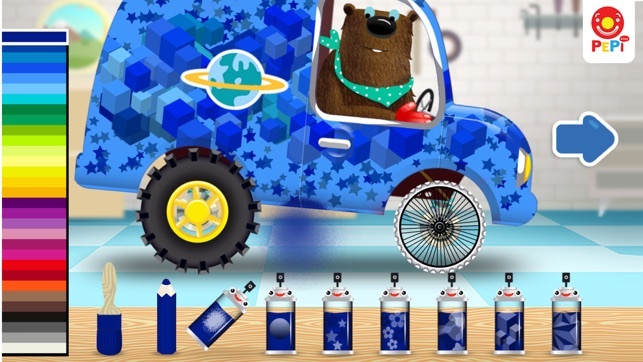 Paint, create, customize cars together and talk about all those wonderful places were your creation may come alive. After it's done, you may leave the kids on the virtual test track, or just go for a real adventure. Visit places, take pictures of your car in real world environment and share them with your family friends! • Paint Room, Sticker Studio, Wheel Shop and more! • Camera to capture your creation in virtual, or real world environment! 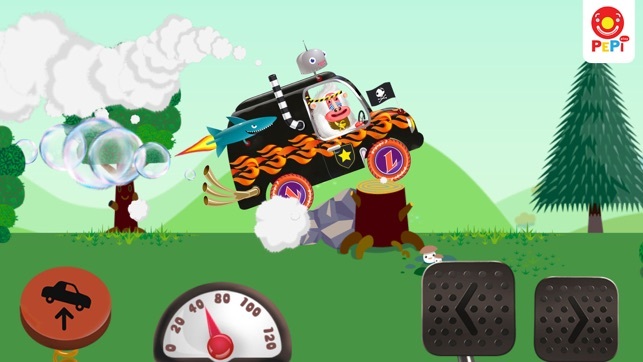 Here at Pepi Play we craft our apps and games with great care. We believe we can create rich interactive experiences and set high standards for ourselves. We pay great attention to details, colours and sounds to create cosy and cheerful environments. We also avoid any third party advertisements and in-app purchases. ...and it's fun sometimes to watch them playing it. Glad it's free but i clicked on the home button too much and here's what it does. 1. The car won't move and if you tap on left or right it makes a loud blurring sound. 2. The vine breaks and there's no way u can escape. 3. If u tap on the jump button the screen moves. 4. If the vine breaks one more time u fall into the hole and the screen freezes. I won't get that app again until that bug is fixed.